In every pension scam there is one beginning, lots of middles, and always a wretched ending for the victim and a profitable ending for the scammers. The beginning is always a negligent, lazy, box-ticking transfer by a ceding provider – the worst of which always tend to be the likes of Standard Life, Prudential, Scottish Widows, Aviva, Scottish Life, Aegon, Zurich etc. Pension scams are rarely simple and there are many different culprits to blame for the losses. The one common theme though, is that not one of the parties involved is prepared to take the blame for the victims’ losses – EVER. It was always someone else’s fault. 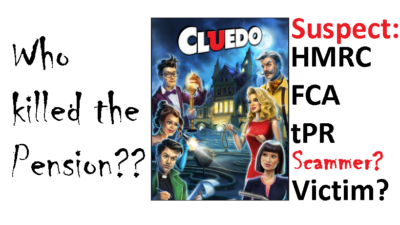 The pension scam trail is rather like a game of Cluedo. The question is: “who murdered the pension fund?”. We travel around the board trying to decipher who is to blame: at which point was the pension fund truly put at risk? – and with what weapon was the pension fund murdered? While the pension fund transfer always starts with the negligent ceding provider, there are financial crime facilitators long before this: our old friends HMRC and the Pensions Regulator. HMRC registers the scams – often to repeat, known scammers. HMRC does no basic due diligence and deliberately ignores obvious signs that the scheme is an out and out scam. Then HMRC does nothing to warn the public when they discover there are dastardly deeds afoot. In the case of an occupational scheme, the Pensions Regulator allows the scheme to be registered and is slow to take any action even when obvious signs of financial crime emerge. In recent cases, we have seen complaints – by the victims of scams – upheld against the ceding provider’s negligence in releasing the pension funds to the scammers and financial crime facilitators. And yet neither HMRC nor the Pensions Regulator is ever brought to account. The biggest problem is that – in the case of pension liberation – HMRC will pursue the victims and not the perpetrators. This then compounds the appalling damage done to thousands of people’s life savings. We have often seen serial scammers like Stephen Ward behind scams such as Ark, Capita Oak, Westminster, London Quantum etc., and yet neither HMRC nor tPR take any action (except to pursue the victims for unauthorised payment tax charges). This is neither just nor reasonable – and yet this practice continues unchallenged. In the case of the Continental Wealth Management scam, there was a further trio of suspects: life assurance companies – Generali and SEB and OMI. These providers of expensive “life bonds” pay the scammers 7% commission and facilitate the crime of defrauding victims into investing into high-risk, expensive, unsuitable investments that earn the scammers further fat commissions. Even when the portfolios have been partially or even fully destroyed (murdered), the life offices still take the huge fees and blame the advisers such as CWM – or even the victims themselves. We also have the so-called regulators – such as the FCA (Facilitating Crime Agency) and tPR (the Pension Rogues), who are supposed to help protect the public from becoming pension scam victims. But these limp and lazy organisations are so slow off the mark, that the scammers have long since vanished by the time they take any action. This is evident in the recent London Capital and Finance investment scam; the FCA was warned back in 2015 but – of course – did nothing. Another suspect in the pension murder crime scene is the Insolvency Service. Back in May 2015, the Insolvency Service published their witness statement in the case of a large cluster of pension scams – including Capita Oak, Henley Retirement Benefits, Berkeley Burke and Careys SIPPS – all invested in Store First store pods. The total scammed out of 1,200 victims was £120 million – and yet the only action that the Insolvency Service has taken has been to try to wind up Store First. Four years later. And all this will do is punish the victims even further – on top of HMRC punishing the victims by issuing tax demands. How long can all the parties involved in these pension scams, go on letting this happen and say it has nothing to do with them? In some cases we have the ceding providers blaming the victims for their losses! Still, to this day, we see victims’ life savings invested in toxic and expensive assets. Nothing meaningful is being done to put a stop to it. The victims lose their money and the scammers escape with bulging pockets full of cash. Other suspects include the advisory firms – some of which have no license to provide financial advice and few have sufficient professional indemnity insurance. Henry Tapper recently wrote an interesting blog recently about the FCA’s suggestion that financial advisory firms should have much higher PI cover. In the offshore advisory space, regulation is still hit and miss – with some firms providing investment advice with only an insurance license. And many providing advice with no license at all. But still QROPS and SIPP trustees routinely accept business from these “chiringuitos”. But even the properly-regulated ones still routinely use expensive, unnecessary “life” bonds – and we now have hard evidence that this is a criminal matter in Spain after our recent DGS ruling against Continental Wealth Management and all associated parties. The saddest footnote to this blog is that many so-called “experts” seem to think that the real culprit is the victim himself. They state that people who fall for scams were “stupid” or “greedy” or “should have known better. The well-worn trite phrase: “if it sounds too good to be true, it probably is” gets trotted out all too frequently. But when even regulated and qualified firms and individuals have convincing sales patters that effectively con people into expensive, high-risk arrangements with hidden commissions and fake promises of “healthy” returns, is it any wonder that so many pensions are murdered every day? And when large institutions like Old Mutual International and Friends Provident International facilitate such pension and investment scams, is it any wonder that so many highly-intelligent, well-educated people get scammed?